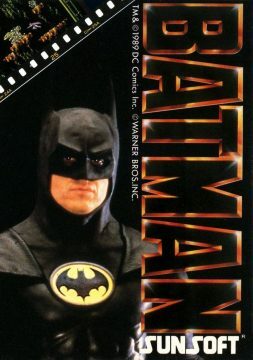 When Tim Burton’s Batman was released in theaters in 1989, it was a massive phenomenon. This was the first big live action appearance of the character since the camp TV series from the 1960s, and the visually darker but still whimsical tone of the movie made it a massive success. 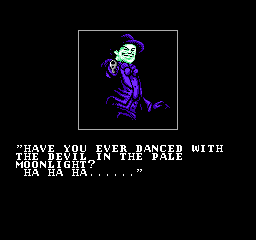 It also created a hugely profitable merchandising empire, with collectible statues of Jack Nicholson’s take on the Joker still being made today. Kids’ games like Lego Batman feature unlockable costumes of Batman as he appeared in this movie. 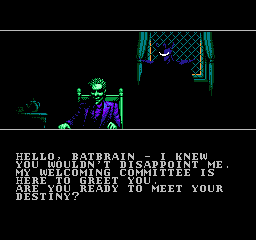 Sunsoft was able to make some easy money by striking a deal to produce official Batman games. They grabbed this opportunity by the horns, producing several different games from 1990 to 1992. Sadly, while a few stand out as excellent, this series ended up going out with a whimper rather than a bang. 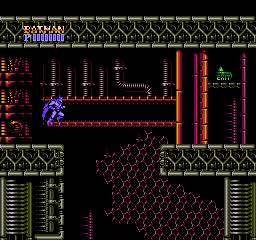 Sunsoft’s first attempt at a Batman game remains its best. 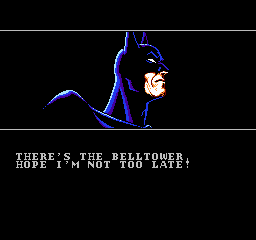 When it was first advertised people were skeptical; why is Batman purple? Why is it so dark? But as soon as it was released people realized that this wasn’t a brainless cash in, but rather a pretty polished take on the character. 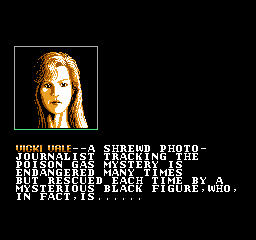 It only has the most basic connections to the movie, with actor likenesses in cutscenes and the game ending with a showdown in a cathedral. With the exception of the third and fourth levels, however, it’s still pretty close to the tone of the movie even if the locations go in a different direction. 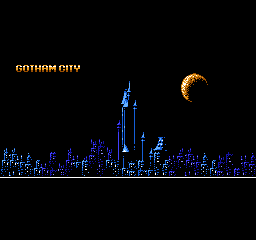 Things start strong, with some foreboding intro music and a moody cutscene of the Batmobile driving around. 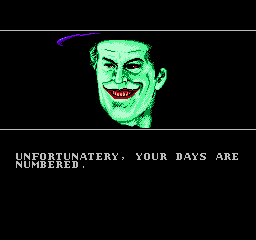 It sets an excessively dark, sinister tone upheld by the entire game. 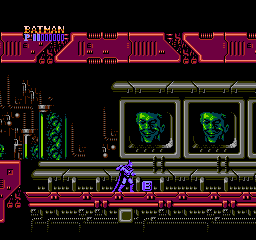 Video games based on movies were nothing new in the NES’ day, but seeing the foreboding aesthetic of the 1989 Batman movie translated so effectively to an NES game was very impressive at the time and still holds up now compared to its contemporaries. The graphics are outstanding from start to finish, giving the impression of each level being part of a much larger world. There’s an expert use of shadow here. 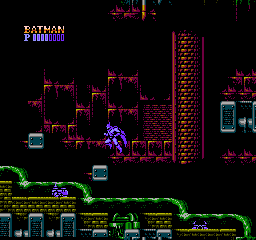 Most of the game’s backgrounds fade into darkness rather than ending with a wall or other border, making the levels feel much more open than they actually are. This is also helped by each level having a significant amount of vertical space, with the screen scrolling in any direction. There are several points in the game where you fall into a new area for seconds, and it helps create a sense of urgency and scope greater than a level timer or not being able to backtrack. 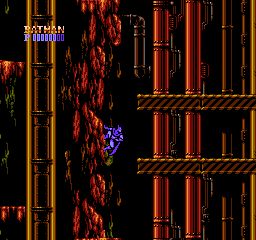 As Batman, players can both punch enemies and also use three extra weapons. The first is the iconic batarang. It’s technically weaker than punching, but can hit an enemy multiple times, making it the most powerful weapon with proper timing. Next is a gun that fires small rockets. It is kind of useless because the projectile it fires is so slow, but at least it has unlimited range. 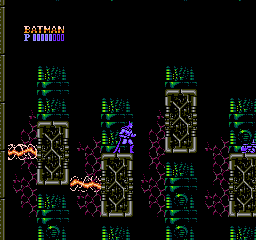 Finally, Batman can throw out a spread of three shuriken (inexplicably called “dirks” in the manual, an old word for a dagger), which does pretty good damage and their spreading out makes it easy to hit enemies. 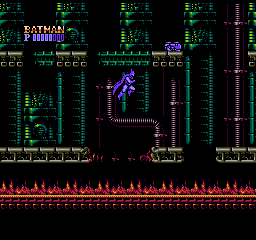 Each weapon draws from a shared pool of ammunition (referred to as pellets in the manual; the other Sunsoft Batman games make a similar half-hearted effort to cover up that you’re just shooting people until they explode in the games) which is regained by killing enemies. 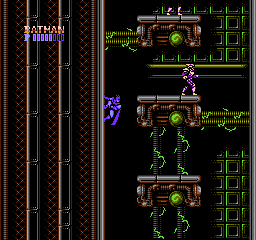 The batarang uses one “pellet”, the spear gun takes two, and the “dirk” (something like a shuriken spread) takes three. Ammunition is fairly plentiful, and easy to refill with the large number of enemies that drop it. So the limits are mostly there to keep you from obliterating the game’s bosses too quickly. 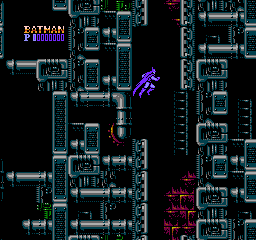 The coolest feature of the controls, however, is how Batman jumps. Like in the Mario games, you can control the height of a jump by how long you hold down the A button. It’s extremely responsive, and much of the game is impossible to pass without mastering it. 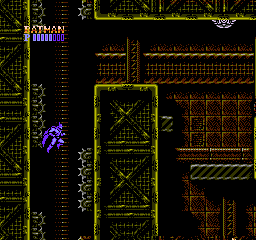 Even more importantly, Batman can jump off of walls when pressing the button again with the right timing. 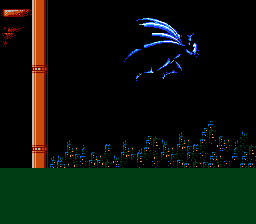 The game makes great use of this, with each of the five levels gradually requiring more and more precision jumping to progress. 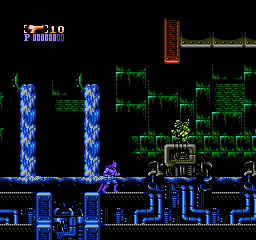 While more powerful enemies are introduced as well, the platforming is where the real challenge of the game comes from. The level design provides a great sense of going places regular people could not reach. Level two, as an example, ends with a path through a small factory. 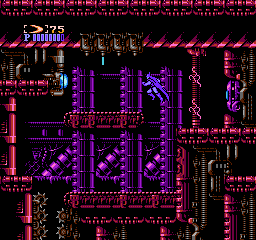 This area is extremely claustrophobic, requiring you to maneuver carefully around gears and conveyor belts. The next level is the opposite, a sprawling sewer network. Despite the linearity, the visually implied scope of it wouldn’t be out of place in adventure games like Blaster Master or Super Metroid. 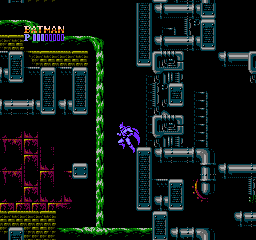 Each level has this same feeling of Batman navigating cavernous, forgotten cracks of a decaying city. It’s a stunning portrayal that, while not accurate to the movie literally, nails it thematically. Looking at the talent of the team making the game this isn’t a surprise. Two names that stand out from the rest are Tadashi Kojima and Yoshiaki Iwata. 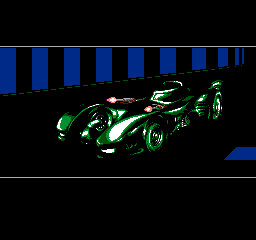 Not just for their work on Batman: The Video Game, but for having the versatility to also do graphics requiring wildly different visual styles, ranging from the colorful pixel art in Super Fantasy Zone to porting the rendered scenery in Riven. 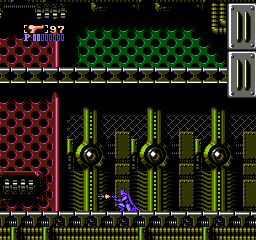 The game’s music is equally impressive, with tracks by Sunsoft regulars Nobuyuki Hara and Naoki Kodaka (Fester’s Quest, Journey to Silius, Blaster Master). These two composers defined Sunsoft’s unique sound in the eighties and nineties. 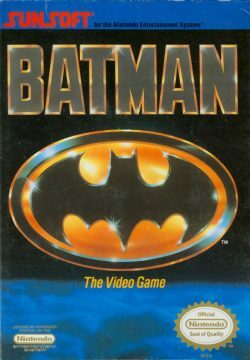 Batman: The Video Game‘s soundtrack has always been highly regarded, with fans arranging their own tributes and remixes to this day. The song used in the first and last level is particularly memorable, but the entire soundtrack is excellent. 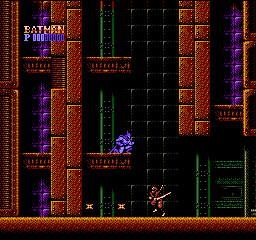 Each song is appropriately aggressive to suit the game’s stark aesthetic, and you can tell that each song was composed specifically to suit the pace and look of each level. 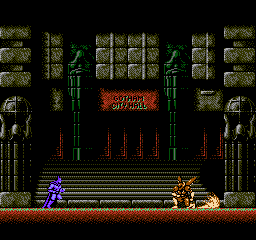 While other popular series like Castlevania also did this, it was still a huge deal at the time for a game to come together with such focused art and sound design. 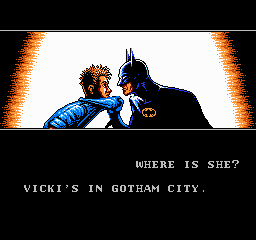 Interestingly, when the game was first revealed in Nintendo Power, it presented completely different cutscenes, closer to the style of the comic book than the digitized stills seen in the final version. This prototype ROM was leaked to the public and is available for download. All of the cutscenes are completely different, with new dialogue. 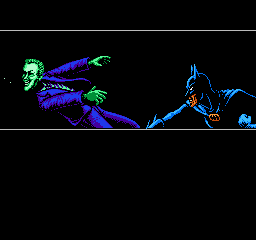 The game doesn’t even end with a proper confrontation against the Joker, instead you fight the Firebird boss, then are treated to a cutscene where Batman walks into the Joker’s office and socks him in the jaw. Some of these looks pretty cool, particularly the animation, but the artist’s rendering seems like a poor trace of Jack Nicholson’s likeness, making it look more comical than it probably should. The ending contains music not found in the final version. Additionally, there are 1up power-ups to be found, which were removed before released.